Joel and Luke Smallbone were born in Sydney, Australia. 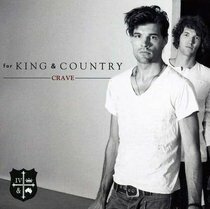 When they launched their band, For King and Country, they wanted to carry a name that would evoke substance and a sense of purpose. Their debut release, "Crave", has struck a nerve with their enthusiastic fan base as the brothers sing and talk about "busted hearts," the need for hope, and a passion for believing in something wholeheartedly. Proving that musical talent runs in the family, the brothers of prominent Christian artist Rebecca St. James deliver a worship album that really raises its head above the crowd and proves their sound unique and refreshing. The lyrics emanate worshipful power and insight, and the vocals of the brothers compliment each other nicely. It's a true stand out album. Also, they're Australian, what's not to love? Why the 5stars you ask? Because, not only does this album contain great music it also contains great lyrics! It's been a long time coming and it's finally here, I think the For King & Country team have done an amazing job in producing this record. Looking forward to future releases by these fab christian artists!